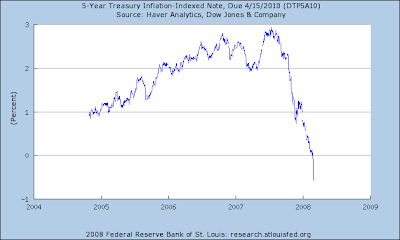 Click on the graph to enlarge and see better an unusual phenomenon: inflation-adjusted interest rates below zero. Nothing in economic theory precludes negative real interest rates, or even suggests they should be anomalous. Nominal interest rates cannot be negative, because people would just hold cash instead of bonds,* but real interest rates can be negative. If real interest rates were very negative, investors could start investing in inventories of goods, but this arbitrage is not easy. Storing goods is costly, and many things in the CPI basket, such as services, are not storable at all. In standard models of asset pricing, negative real interest rates are most likely to arise if growth expectations are particularly low or if uncertainty is particularly high. Low growth expectations encourage households to save, which drives down equilibrium rates of return. High uncertainty drives up risk premiums, which in turn drives down the return on safe assets, perhaps below zero. Both forces seem to be working now. *Clarification: A reader points out, correctly, that nominal interest can be slightly negative if there are costs to holding cash.